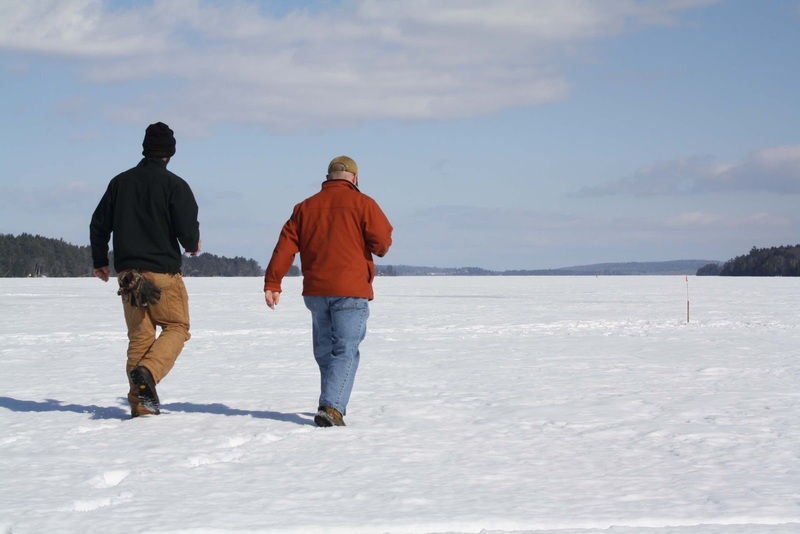 It is perhaps the most important question that all ice fishermen contend with and a frequent point of contention, when to set the hook. Though a relatively simple question, the answer is of course, difficult to calculate and based on a mind-blowing set of variables. Water depth, the consistency of the bottom, weed beds, the targeted species, size of bait, the speed the line is spooling, has the line stopped, direction the line is heading (straight down or off to side) and what is your level of patience? All these factors must be considered and play a critical role in when to decide it is time to tug on that line. I have watched ice fishermen successfully land large Lake Trout (see video and note the fish had barely eaten the large bait!) after timing when they set the hook based on the length of time it takes them to smoke an entire cigarette. I'll admit it might not be an "exact" science but some ice fishermen seem to have a sixth sense about specifically when to set the hook, their minds apparently ripe with the ability to run the approximately one million calculations with the efficiency of Rainman. Now personally, I have always been a wait and see kind of ice fisherman. Watch the line and wait, letting the fish dictate when that time to yank is "right". If the line isn’t moving or it is barely creeping along, it is often best to delay and allow the fish time to swallow the bait. If you are fishing in very shallow water or an area with many underwater obstructions, the amount of time you decide to wait before setting the hook, must be tempered against the possibility that the fish will tangle itself on boulders, stumps and logs, in an attempt to free itself. Watching line spool off the line with such speed that it causes water to rooster tail off the reel is what ice fishermen live to see. This is typically a good sign that the fish has a solid hold on the bait and an effective hook set can be made. I am also very fond of the short run, line stop (fish eating bait) and the second run. Often as soon as the second run starts I set the hook. As with all things dealing with a wide set of unknowns, even when you do everything right it will be wrong. Ice fishing is about trial and error, learning from mistakes and basking in the warm glow of landing a truly monster fish. 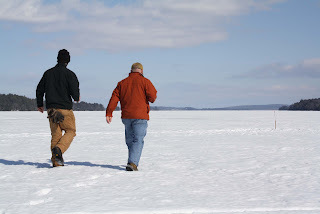 If you have never ice fished, I strongly suggest trying it just once; you will be pleasantly surprised at how much you will enjoy the experience! To all the hard water masters good luck this season and hopefully I will see you out there on the ice! Look at all the beautiful ice. We had such a short ice fishing season this year, I miss it. Thanks for sharing this great information. Rea, I was in Northern Maine last weekend with over 18 inches. Central part of state is hovering around 9. I have an entire WEEK of ice fishing ahead of me . . . can't wait! FEBACHERY AWAITS!! Is West Grand part of FEBACHERY? PB, Not this year. We are currently in the negotiation stage of potentially planning a spring trip!